It is The Thrive Archive’s policy to respect your privacy regarding any information we may collect from you across our website, www.thrivearchive.org and other sites we own and operate. When you visit our website, our server providers and ISP’s may automatically log the standard data provided by your web browser. It may include your computer’s Internet Protocol (IP) address, your browser type and version, the pages you visit, the time and date of your visit, the time spent on each page, and other details. This serves to protect our website and any information we store on our server. On our contact page we ask you to contact us with your stories. Access and data portability: You may request details of the personal information that we hold about you. You may request a copy of the personal information we hold about you. Where possible, we will provide this information in easily readable machine format. You may request that we erase the personal information we hold about you at any time. You may also request that we transfer this personal information to another third party. This policy is effective as of 11 March 2019. 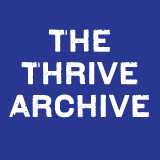 The Thrive Archive goes on tour!